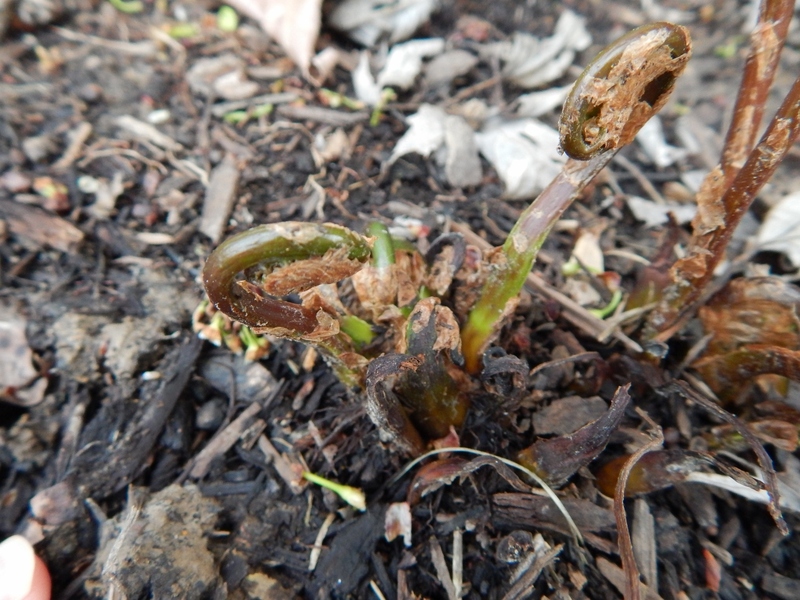 Right now, spring garden watching in Arch City finds young fern fiddleheads gracefully unfurling, soon to become lovely fronds. Last year I bought 3 ferns, Sensitive (Onoclea sensibilis) and Ostrich fern (Matteuccia struthiopteris) from my local nursery and planted them beneath a tree along the fence. I am happy to see they have returned for Season 2 in my gardens. 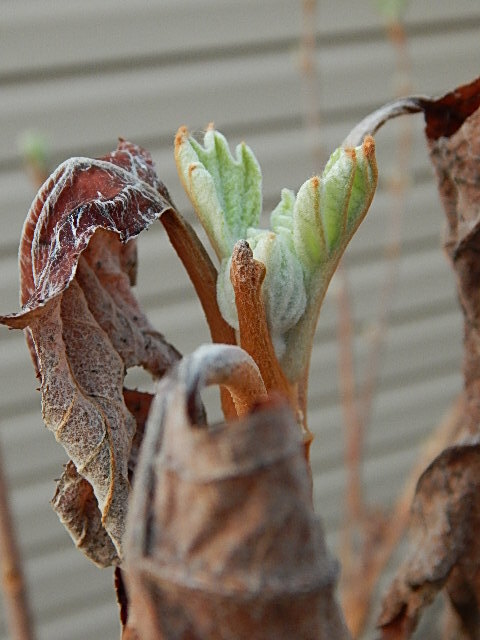 A few weeks after planting, I was back at the nursery asking about what appeared to be their failure to thrive. 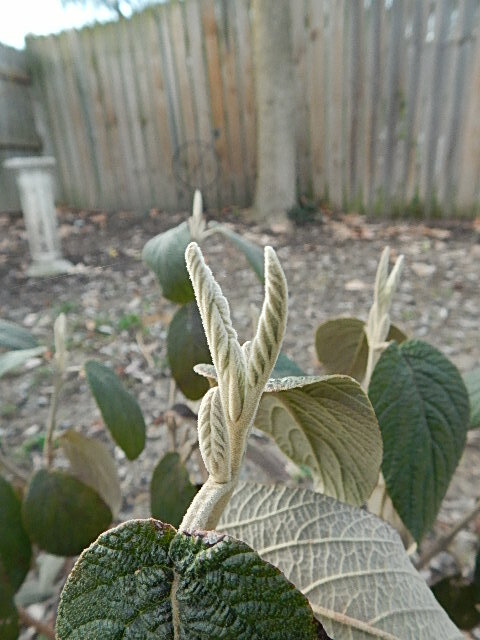 They seemed to be withering and not doing well. Was it too hot for them? No. Perhaps I planted them too deep, the woman at the nursery asked. Hmmmmm. Maybe so. They do like moisture and I was out of town for a bit and they did not get watered. Don’t worry, she assured me, they are a lot tougher than they look. I replanted them but they never really seemed to take. I had also come across a neighbor who was dividing her ferns and added three more to the yard, this time in the bed near the garage. Ah yes, the right spot! They did wonderfully. But as I said, the fern are back and the all look spectacular. Soon I will placing them in the new bed. My first nursery purchase this season was three more Ostrich fern. The rain has stopped–for now, as there is more in the forecast–so things may dry out enough that I could begin planting. Did you know these Fun Facts About Ferns? 1. Like the cockroach, they are survivors. Ferns have been around since nearly the dawn of time (they predate the Mesozoic era) and are older than land animals and dinosaurs. At one time, they were the dominant plant on earth. 2. They may be strong but they are sensitive and particular about their habitat, mostly preferring moisture and protection from too much sun, too much wind and freezing temps. 3. Ferns are a vascular plant and reproduce sexually using spores. They need moisture to reproduce, one of the reasons they are often seen in profusion around ponds and streams. 4. The fiddlehead is the unfurled frond of the young fern, and many consider them a culinary delicacy. I had my first taste of fiddleheads in Portland, ME last spring. They were very tender and reminded me of young asparagus. 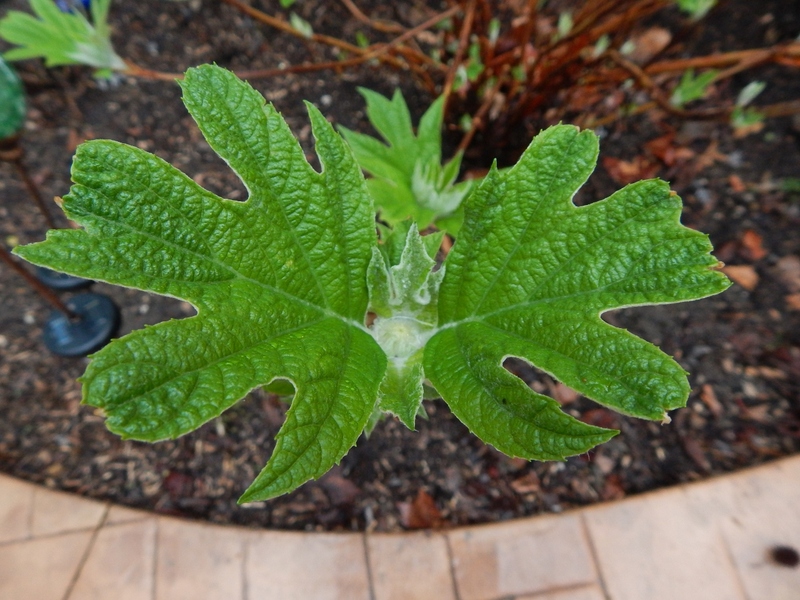 But before you start harvesting your unfurled fronds, beware! Only a few species’ fiddleheads are edible. Categories: Musings, Uncategorized | Tags: fiddleheads, Ostrich fern, sensitive fern | Permalink. It has rained buckets in St. Louis. 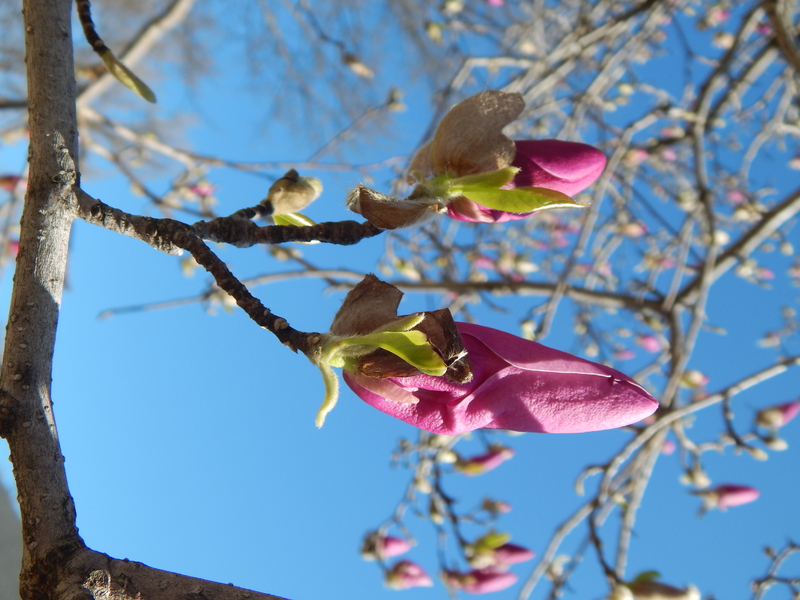 The photos from my last few posts were taken during the brief reprieves Mother Nature provided. I’m sure even She gets tired of pouring rain. I know my sump pump is working over time, and a distinct “squish” can be heard and felt underfoot during my now twice daily yard and garden inspections. Just three days ago some parts of the St. Louis region received more than 3 inches of rain. And I believe we got a repeat performance early yesterday morning and throughout the day. Standing water is common after heavy rains in the low lying area of the yard. This is one of the problem areas of the yard. And I am attempting to address it with plants that like standing water. 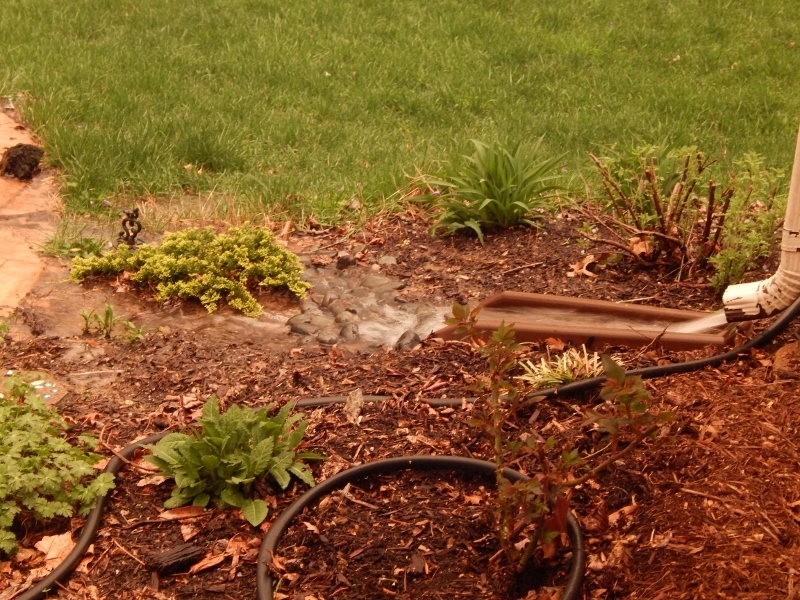 Ponding occurs in the southeast corner of the yard after prolonged rain or a very hard rain. 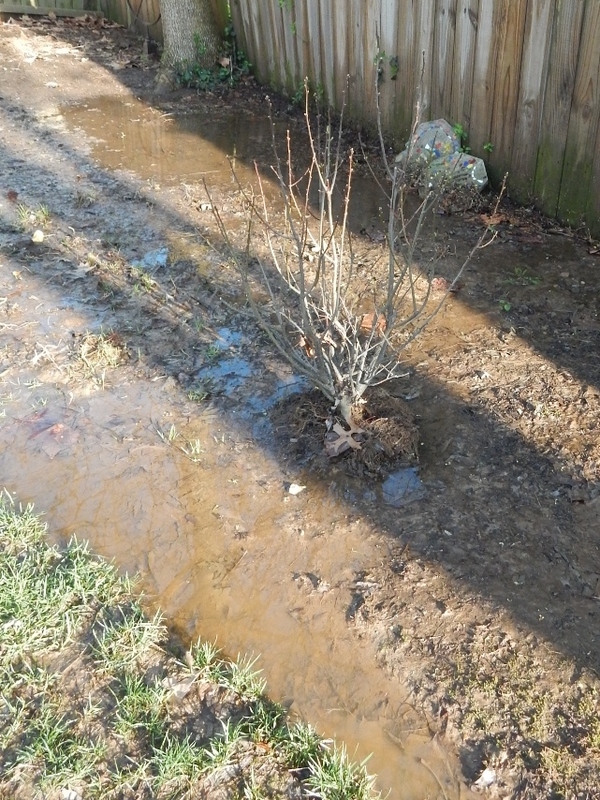 I planted winterberry in this spot last fall because it supposedly withstands standing water. Needless to say, my first plant purchases for the season remain unplanted. Accompanying the rain are very warm temperatures. Today we were near the mid-80s F. This puts us more than 20 degrees above normal. While I expect we will cool off, I am not too worried about a major freeze, as our average last frost date is April 12, just days away. Lest I begin to sound like a complainer, let me cast some sunshine on this predicament. 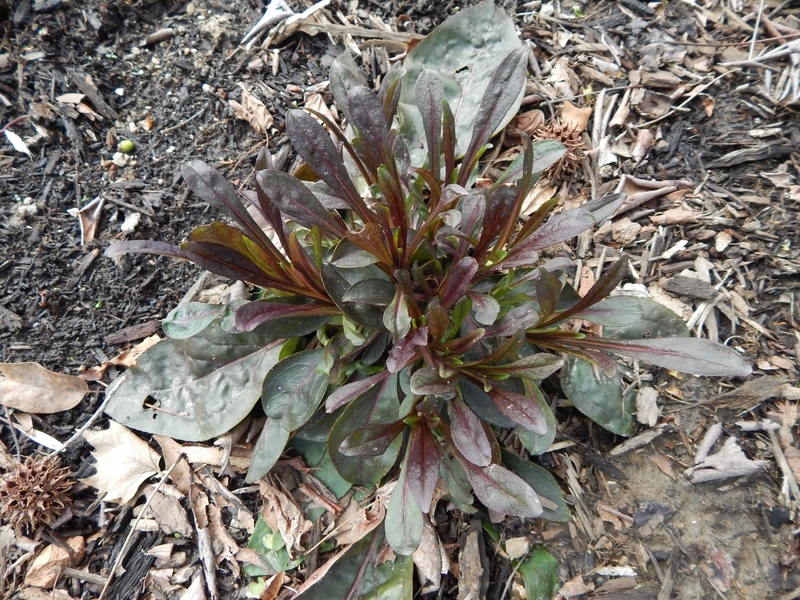 The lawn, trees, shrubs and perennials are emerging quicky. The tonic of moisture and warm temperatures are just what they need. Here’s a closer look at their progress. 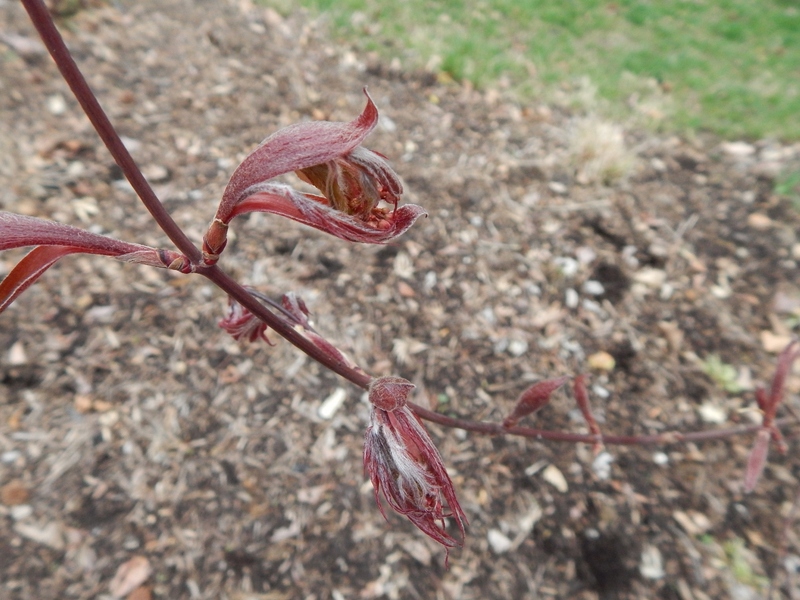 Astilbe Chinensis “Visions” are coming along. Heuchera “Plum Royal” is peeking out near the botton right. 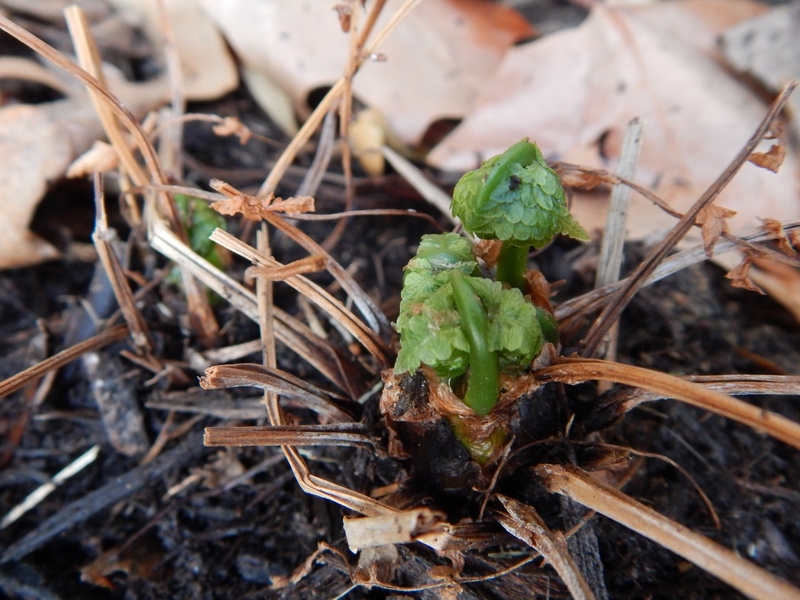 The ferns I planted last summer–and thought would not return–are back! 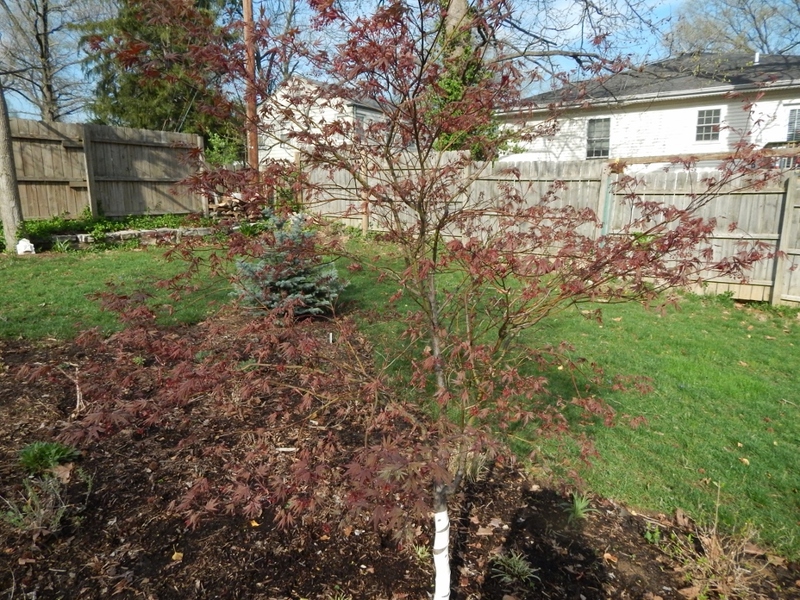 The Bloodgood Japanese Maple has been a proven winner in my yard since I planted it in 2012. 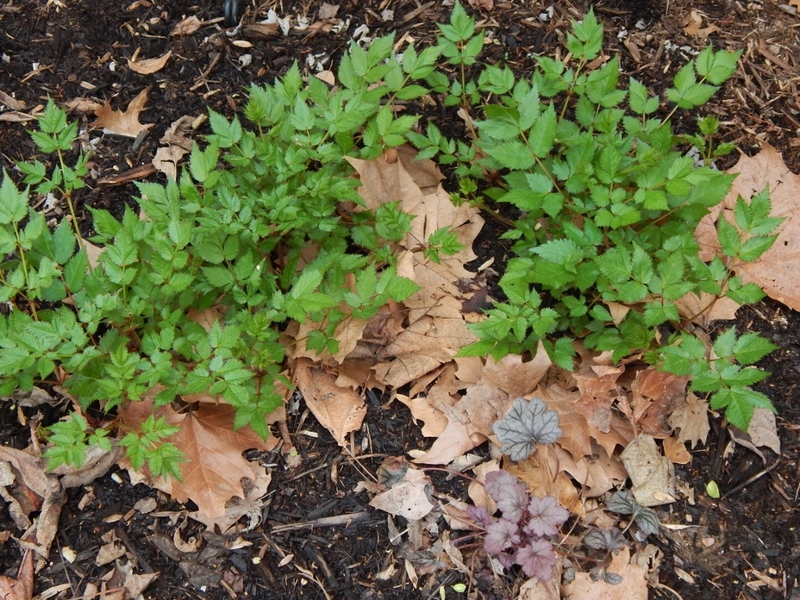 Categories: Musings | Tags: astilbe, bloodgood Japanese Maple, oakleaf hydrangea, Ostrich fern, penstemon | Permalink. 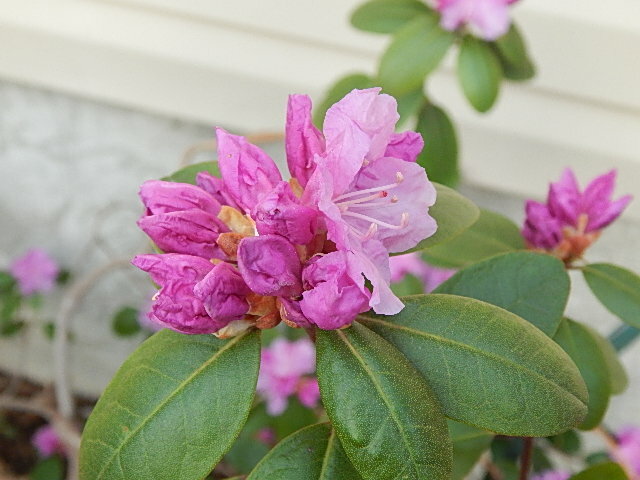 Categories: Leatherleaf Viburnum, Oakleaf Hydrangea, PJM Rhododendron | Permalink. Crisp as a cracker. That’s how the air felt Saturday morning. 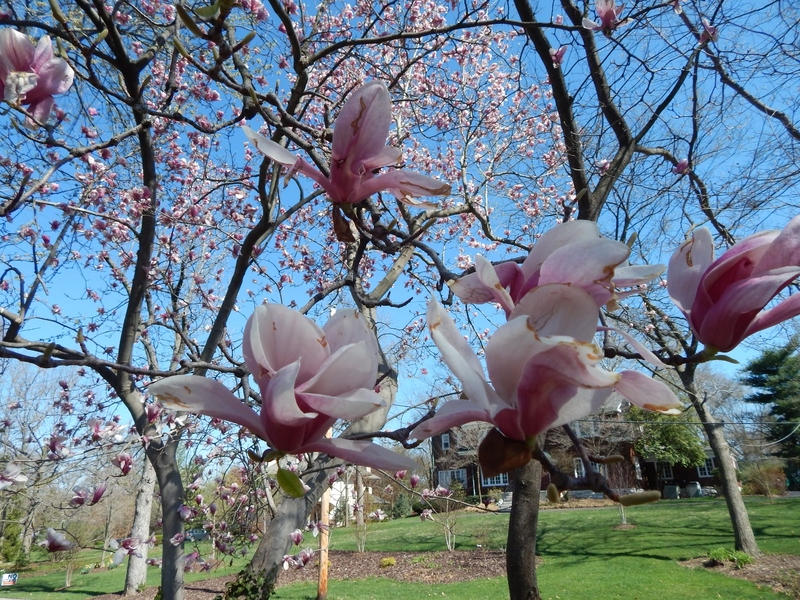 Fresh and cool, I believe Spring is at its glorious peak in St. Louis. 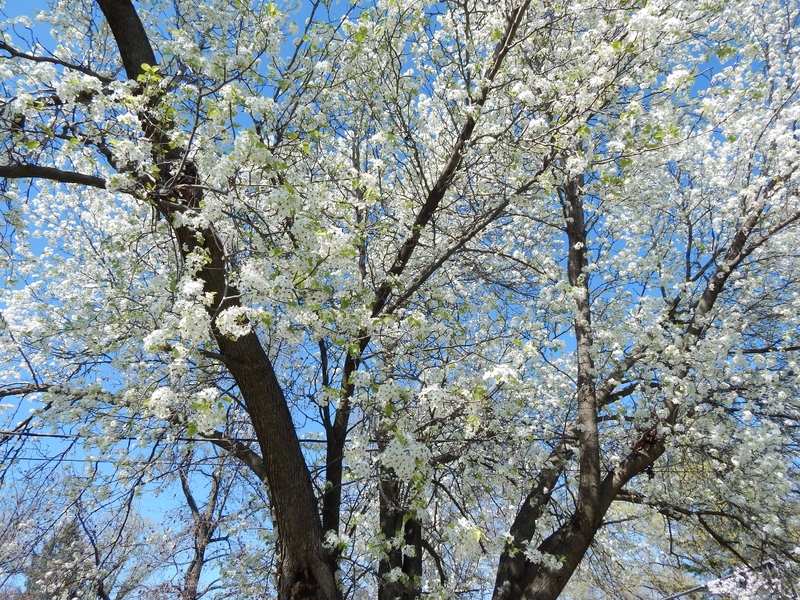 Daily the local landscape is pop, pop, popping with an abundance of gorgeous flowering trees. There was a real freshness in the air when I took an early morning walk. We had a drenching rain on Thursday, a cleansing rain that rid the streets of any remaining salt and debris and washed winter away. 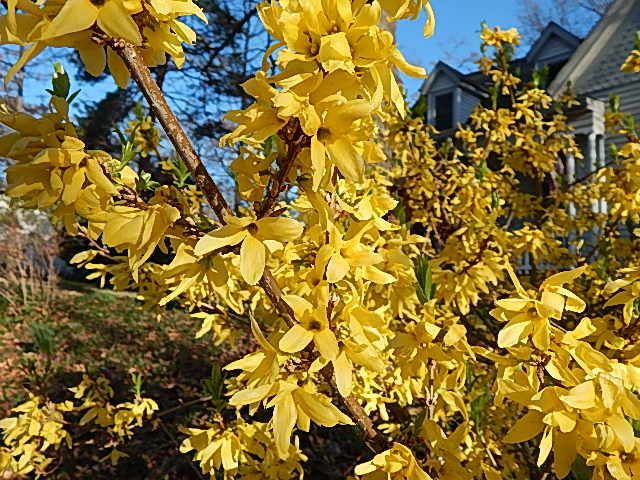 Friday’s rainy, overcast disposition turned sunny with bright blue skies and temperatures in the low 50s when I got out and about on Saturday morning. 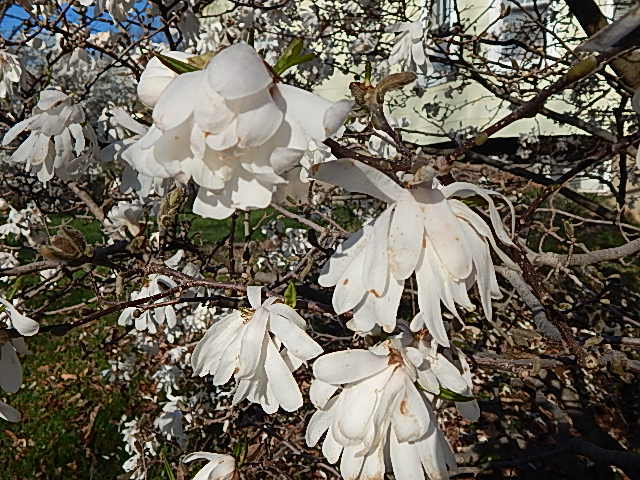 Here is what I glimpsed: Pink, yellow and white magnolias; bright, bright yellow forsythia; purple red bud just beginning to burst; soft pink cherry trees in full bloom; rosy-red and white flowering crabapple trees, and rows of Christmas-tree shaped Bradford pear standing tall in white bloom along the the edge of the road. All are on display in their full glory just a short walk from my home. I wasn’t the only one to take notice. Front porches are pretty much a staple in this area and I came upon more than one resident sitting on their porch, newspaper and coffee cup in hand enjoying the alpine-like air. This time of year is fleeting. I am glad I made time to stop and smell the roses. 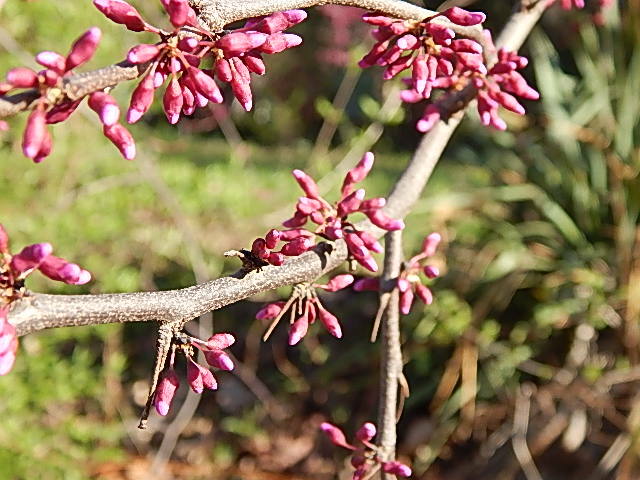 Categories: Musings | Tags: Bradford pear, forsythia, Japanese magnolia, red bud | Permalink.